A United Kingdom based organisation. 2012: The concept for T. R. Robinson Publications originated in October 2012 when author Tanya Robinson published her first book. A simple blog was established under the then author name of Tanya Robinson. Details of published works, along with book reviews and articles detailing experiences and knowledge gained of the publishing processes were included. The latter with the intended aim of assisting fellow authors. 2014: December 2014 saw a change in published author name to T. R. Robinson and the establishment of a new blog. Again this was used to share details of published works, experiences and knowledge gained, as well as; highlighting changes in publishing and social media procedures; book reviews; and author interviews. 2016: Eventually the requirement for a professional identity was recognised. T. R. Robinson Publications was established in October 2016 together with this supporting website. Helping authors with publicity for their books. T. R. Robinson is the owner and chief executive of T. R. Robinson Publications. At first the thought of occupying such a position never crossed T. R.’s mind. The origins may be traced back to her career as an independent author of memoir, autobiography, biography and fiction all of which are based upon life experiences; hers and others. Not a British national by birth, she first moved to England upon marriage to a British Naval Lieutenant who had been a member of an allied naval force liberating her homeland from occupation. Her husband proved to be a cruel and violent man and eventually, primarily for the sake of her young son, she escaped from his grip. Subsequently, having to find the means to support her son and herself, she undertook a variety of different employments: managing small electrical components, laboratory assistant, hospital orderly, waitress and much more between. T. R.’s author career commenced in 2013 and developed to the point where a more robust means for publicising and marketing had to be found. At the same time, having appreciated all the help received in the earlier years of authoring, she wanted to offer a service for other authors as well as readers. This lead to the formation of T. R. Robinson Publications, as detailed above. 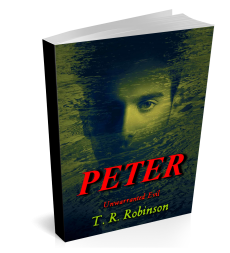 Note: Long term visitors to, and users of, T. R. Robinson Publications know and address T. R. by her first name. With the advent of multiple self-publishing services and facilities many have taken the opportunity to write and publish family tales and those stories that had occupied their minds but for which they could not find an agent or publisher. The majority are everyday individuals with no authoring knowledge or experience and consequently, look for help and guidance. T. R. Robinson Publications was established to provide such a service as far as it is within T. R. Robinson’s capabilities. Prospective authors as well as new, inexperienced ones, may find a variety of free information and help at T. R. Robinson Publications. There are hints and ideas on: How to go about the writing process; How to utilise some of the self-publishing services available; How to publicise and market books; How to use some social media sites; What is needed in an author website and blog; Books to read; etc. More is added each week. It would be impracticable to add samples here of the assorted products and information available from T. R. Robinson Publications. One extract or image would not truly identify the diversification. To gain an understanding of these please consider the ‘Blog’ and ‘Books’ pages of the website. Contact form or use the ‘Contact’ tab to the left of this page. You may copy and save the above to your own network.